Landlord hereby leases to Tenant and Tenant hereby leases from Landlord the Premises for the Term and upon the terms, covenants and conditions provided in this Lease. In the event Landlord delivers possession of the Premises to Tenant prior to the Commencement Date, Tenant shall be subject to all of the terms, covenants and conditions of this Lease (except with respect to the payment of Rent) as of the date of such possession. (a) The Commencement Date shall be the date which is the earlier of (i) the date on which the Landlord Work is Substantially Complete (recognizing that may occur before, on or after the Projected Commencement Date); or (ii) the date Tenant first accepts possession and occupies all or part of the Premises for the conduct of business. (b) Within thirty (30) days following the occurrence of the Commencement Date, Landlord and Tenant shall enter into an agreement (which is attached hereto as Rider 1) confirming the Commencement Date and the Expiration Date. If Tenant fails to enter into such agreement, then the Commencement Date and the Expiration Date shall be the dates designated by Landlord in such agreement. (a) If Landlord shall be unable to give possession of the Premises on the Projected Commencement Date by reason of the following: (i) the Building has not been sufficiently completed to make the Premises ready for occupancy, (ii) the Landlord Work is not Substantially Complete, or (iii) for any other reason, then Landlord shall not be subject to any liability for the failure to give possession on said date. Under such circumstances the Rent reserved and covenanted to be paid herein shall not commence until the Premises are made available to Tenant by Landlord, and no such failure to give possession on the Projected Commencement Date shall affect the validity of this Lease or the obligations of Tenant hereunder. At the option of Landlord to be exercised within thirty (30) days of the delayed delivery of possession to Tenant, the Lease shall be amended so that the Term shall be extended by the period of time possession is delayed. The said Premises shall be deemed to be ready for Tenant's occupancy and Substantially Complete in the event Landlord's Work is Substantially Complete in fact, or if the delay in the availability of the Premises for occupancy shall be due to any Tenant Delay and/or default on the part of Tenant and/or its subtenant or subtenants. In the event of any dispute as to whether the Landlord Work is Substantially Complete, the decision of Landlord's architect shall be final and binding on the parties, except as otherwise provided in Section 2.08. (b) Notwithstanding any provision of Subsection (a) above to the contrary (but subject to the provisions of Section 2.08 in the event of a dispute as to Substantial Completion), if Substantial Completion of Landlord's Work does not occur on or before the Kickout Date (defined below), and Tenant has not, with Landlord's consent taken possession and occupancy of the Premises and commenced doing business (other than construction of the Tenant Work) from it prior to Substantial Completion of the Landlord Work, then, as Tenant's sole and exclusive remedy, Tenant shall have the option to terminate this Lease exercisable by giving written notice to Landlord within three (3) business days after the Kickout Date. If Tenant does not timely give notice of its election to terminate this Lease as aforesaid and Substantial Completion of Landlord's Work does not occur on or before the date which is thirty (30) days following the Kickout Date, then Tenant shall again have such option to terminate this Lease in the manner described above and such date shall constitute the new Kickout Date; it being the intention of the parties that Tenant shall have a recurring termination option after each such thirty (30) day period following the initial Kickout Date if Substantial Completion of Landlord's Work shall not have occurred by the end of each such thirty (30) day period. As used in this Lease, "Kickout Date" means the initial Kickout Date which is ninety (90) days after the Projected Commencement Date and any succeeding new Kickout Dates (at thirty (30) day intervals after the initial Kickout Date) and each such Kickout Date, as applicable, shall be extended by the number of days of delay due to Force Majeure plus the number of days of Tenant Delay, if any. On or before the Kickout Date, if such date includes any period of Force Majeure or Tenant Delay, Landlord shall give Tenant written notice of the resulting calendar date which the Kickout Date. Landlord and Tenant agree that for all purposes of this Lease, the Rentable Area of the Premises and the Rentable Area of the Building as set forth in Article One are controlling and are not subject to revision after the date of this Lease, except as otherwise provided herein. Tenant shall notify Landlord in writing within thirty (30) days after the later of Substantial Completion of the Landlord Work or when Tenant takes possession of the Premises of any defects in the Premises or in the materials or workmanship furnished by Landlord in completing the Landlord Work (collectively, "Defects"). Except for Defects stated in such thirty (30) day notice and Latent Defects (defined below) of which Tenant gives Landlord notice within eleven (11) months after Substantial Completion of the Landlord Work, Tenant shall be conclusively deemed to have accepted the Premises "AS IS" in the condition existing on the date Tenant first takes possession, and to have waived all claims relating to the condition of the Premises. Landlord shall proceed diligently to correct the Defects stated in the applicable notice unless Landlord disputes the existence of any such Defects. In the event of any dispute as to the existence of any Defects, the decision of Landlord's architect shall be final and binding on the parties, except as otherwise provided in Section 2.08. For purposes of this Lease, "Latent Defects" shall mean Defects which were not readily apparent when the thirty (30) day notice was due. No agreement of Landlord to alter, remodel, decorate, clean or improve the Premises or the Property and no representation regarding the condition of the Premises or the Property has been made by or on behalf of Landlord to Tenant, except as may be specifically stated in this Lease. (a) Right to Use Common Areas. Tenant shall have the non-exclusive right, in common with others, to the use of any common entrances, drives and similar access and serviceways and other Common Areas in the Project. The rights of Tenant hereunder in and to the Common Areas shall at all times be subject to the rights of Landlord and other tenants in the Project who use the same in common with Tenant, and it shall be the duty of Tenant to keep all the Common Areas free and clear of any obstructions created or permitted by Tenant or resulting from Tenant's operations. Tenant shall not use for storage purposes the Common Areas or common facilities of the Building or the Project, including any electrical and/or telephone room of the Building, common entrances, drives and similar access and serviceways, parking lot or trash enclosures. Nothing herein shall affect the right of Landlord at any time to remove any persons not authorized to use the Common Areas or common facilities from such areas or facilities or to prevent their use by unauthorized persons. (b) Changes in Common Areas. Landlord reserves the right, at any time and from time to time to (i) make alterations in or additions to the Common Areas or common facilities of the Project, including constructing new buildings or changing the location, size, shape or number of the driveways, entrances, parking spaces, parking areas, loading and unloading areas, landscape areas and walkways, (ii) designate property to be included in or eliminate property from the Common Areas or common facilities of the Project, (iii) close temporarily any of the Common Areas or common facilities of the Project for maintenance purposes, and (iv) use the Common Areas and common facilities of the Project while engaged in making alterations in or additions and repairs to the Project; provided, however, that reasonable access to the Premises, Truck Court and Tenant's Parking Area remains available, and any such action shall not materially and adversely interfere with Tenant's occupancy of the Premises or the conduct of Tenant's business therein. (1) Tenant shall have the right to use the Tenant's Parking Area for parking of Tenant's vehicles and those of its employees and invitees. Tenant's Parking Area shall be located in certain areas of the Truck Court, which Truck Court is shown on Exhibit C and in such other areas of the Property as Landlord designates, as shown and provided on Exhibit C.
(2) Tenant shall have the right to use the area designated as the Truck Court on Exhibit C for loading, unloading and parking of Tenant's vehicles and those of its employees and invitees. (3) Tenant's Parking Area and the Truck Court are not part of the Common Areas, and Tenant's use of Tenant's Parking Area and the Truck Court shall be subject to the same obligations and conditions that apply to Tenant with respect to the Premises in the same manner as if such areas were a part of the Premises. Tenant shall not be obligated to repave the Tenant's Parking Area or Truck Court except for improper use and to repair and restore any damage in connection with installation, maintenance, repair or removal of any Tenant Additions affecting the Truck Court. (b) Landlord's Access; Third Parties. Landlord fully reserves the right for Landlord or Landlord's agents to enter and use such areas to the same extent as if such areas were part of the Premises or Common Areas. Landlord shall have no obligation to restrict or control access of third parties to such areas, or to tow or remove any vehicles of third parties. Upon completion of a chain link fence (as part of the Landlord Work pursuant to the Workletter) on the westerly side of the Truck Court, which will be added to existing fencing and gates, the Truck Court and East Parking Area will be enclosed within fences with gates. The Relocation Parking Area shall be as described in Section 2.07(a)(1) above. (a) Landlord and Tenant shall select a Qualified Architect to act as arbitrator hereunder in accordance with the procedure specified below. For purposes hereof, a "Qualified Architect" shall mean an architect licensed in the State of ________ who is familiar with the construction of tenant improvements in warehouse and distribution buildings in the county in which the Building is located. Within twenty (20) business days after Tenant's Dispute Notice, Landlord shall in writing propose to Tenant its choice of a Qualified Architect. If Tenant reasonably objects to Landlord's proposed Qualified Architect, it shall in writing notify Landlord within ten business days after Landlord's proposal. In the event of timely objection, Landlord shall within an additional ten (10) business days in writing propose another Qualified Architect and the foregoing process shall continue until Landlord and Tenant have agreed upon a Qualified Architect. If Landlord and Tenant cannot agree on a Qualified Architect to act as arbitrator after five proposals are made and rejected, either party may petition the then Chief Judge of the United States District Court having jurisdiction over the county in which the Building is located to appoint a Qualified Architect as the arbitrator. In the event of Landlord's failure to propose an arbitrator, Tenant may within ten (10) business days after the expiration of the period for Landlord to propose a Qualified Architect, propose its own choice of a Qualified Architect to act as arbitrator and Landlord may reasonably object. If neither party timely proposes an arbitrator, the determination of Landlord's architect shall be final and binding with the same force and effect as a determination by the arbitrator. If an objection is not timely made to a proposed arbitrator, that arbitrator shall be deemed selected and accepted as of the date of expiration of the ten (10) business day period within which an objection could be made, and shall act as the arbitrator hereunder. (b) Within fifteen (15) business days after selection of a Qualified Architect to act as arbitrator, each of Landlord's architect and Tenant's architect shall render in writing to each of Landlord, Tenant and the selected arbitrator, its determination in accordance with the provisions of this Lease of the disputed item(s) and corresponding date of Substantial Completion or defect(s) to be corrected, as the case may be. (c) Within thirty (30) days after the arbitrator has received a copy of the determination of Landlord's architect and Tenant's architect as provided above, as to each disputed item, the arbitrator shall select that one of the two submitted determinations which is closer to the arbitrator's determination. The arbitrator's determination shall be made in accordance with the provisions of this Lease applicable to such disputed item, and in no event shall the arbitrator, Landlord's architect or Tenant's architect modify any provision of the Lease in arriving at its respective determination. The arbitrator's determination and selection shall be made in writing to both Landlord and Tenant, and shall be final and binding upon them. (d) The arbitrator shall have the right to consult experts and competent authorities regarding factual information or evidence pertaining to a determination of the disputed item(s); provided, however, that any such consultation shall be made in the presence of Landlord, Tenant and their representatives, with full right on the part of each to cross-examine. (e) In the event of any failure, refusal or inability of the arbitrator to act, a successor shall be appointed in the same manner provided above for the arbitrator's appointment. Each party shall bear all costs and expenses of its own architect and both shall equally share all costs and expenses of the arbitrator, if any. All attorneys' fees and expenses of witnesses shall be paid by the party engaging such attorney or calling such witness. (f) In the event the determination of the disputed item(s) has or have been submitted to arbitration but such arbitration has not been concluded prior to the Commencement Date (as initially determined by Landlord's architect), Tenant shall pay to Landlord Rent from and after such date pending determination of the disputed item(s). In the event the Commencement Date for Rent determined by arbitration results in an amount due for Rent different from the amount paid to date, Tenant shall immediately pay to Landlord any greater amount due and Landlord shall give Tenant a credit against the next Monthly Base Rent installments due from Tenant if the amount due is less that that paid to date. Tenant agrees to pay to Landlord at the first office specified in Section 1.01(2), or to such other persons, or at such other places designated by Landlord, without any prior demand therefor and without any deduction or offset whatsoever, Rent, including Monthly Base Rent, Rent Adjustment Deposits and Rent Adjustments in accordance with Article Four. Monthly Base Rent shall be paid monthly in advance on the first day of each month of the Term, except that the first installment of Monthly Base Rent shall be paid by Tenant to Landlord concurrently with execution of this Lease. Monthly Base Rent shall be prorated for partial months within the Term. Tenant's covenant to pay Rent shall be independent of every other covenant in this Lease. It is intended that this Lease be a "triple net lease," and that the Rent to be paid hereunder by Tenant will be received by Landlord without any deduction or offset whatsoever by Tenant, foreseeable or unforeseeable. Except as expressly provided to the contrary in this Lease, Landlord shall not be required to make any expenditure, incur any obligation, or incur any liability of any kind whatsoever in connection with this Lease or the ownership, construction, maintenance, operation or repair of the Premises. (b) Any Rent Adjustments due in excess of the Rent Adjustment Deposits in accordance with Section 4.02. (c) Any change in the Rent Adjustment Deposit due monthly in the current Adjustment Year, including the amount or revised amount due for months preceding any such change pursuant to Landlord's Statement. Tenant shall pay to Landlord within thirty (30) days after receipt of such statement any amounts for Rent Adjustments then due in accordance with Landlord's Statement. Any amounts due from Landlord to Tenant pursuant to this Section shall be credited to the Rent Adjustment Deposit next coming due, or refunded to Tenant within thirty (30) days after Landlord's Statement is given if the Term has already expired, provided Tenant is not in default hereunder. No interest or penalties shall accrue on any amounts which Landlord is obligated to credit or refund to Tenant by reason of this Section 4.02. Landlord's failure to deliver Landlord's Statement or to compute the amount of the Rent Adjustments shall not constitute a waiver by Landlord of its right to deliver such items nor constitute a waiver or release of Tenant's obligations to pay such amounts. The Rent Adjustment Deposit shall be credited against Rent Adjustments due for the applicable Adjustment Year. During the last complete calendar year or during any partial calendar year in which the Lease terminates, Landlord may include in the Rent Adjustment Deposit its estimate of Rent Adjustments which may not be finally determined until after the termination of this Lease. 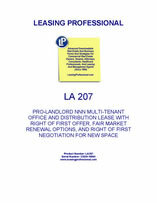 Tenant's obligation to pay Rent Adjustments survives the expiration or termination of this Lease. Landlord shall maintain books and records showing Operating Expenses and Taxes in accordance with sound accounting and management practices, consistently applied. Tenant or its representative shall have the right, for a period of ninety (90) days following the date upon which Landlord's Statement is delivered to Tenant, to examine Landlord's books and records with respect to the items in the foregoing statement of Operating Expenses and Taxes during normal business hours, upon written notice, delivered at least three (3) business days in advance. If Tenant does not object in writing to Landlord's Statement within one hundred twenty (120) days of Tenant's receipt thereof, specifying the nature of the item in dispute and the reasons therefor, then Landlord's Statement shall be considered final and accepted by Tenant. Any amount due to Landlord as shown on Landlord's Statement, whether or not disputed by Tenant as provided herein shall be paid by Tenant when due as provided above, without prejudice to any such written exception. In addition to Monthly Base Rent, Rent Adjustments, Rent Adjustment Deposits and other charges to be paid by Tenant, Tenant shall pay to Landlord, upon demand, any and all taxes payable by Landlord (other than federal or state inheritance, general income, gift or estate taxes) whether or not now customary or within the contemplation of the parties hereto: (a) upon, allocable to, or measured by the Rent payable hereunder, including any gross receipts tax or excise tax levied by any governmental or taxing body with respect to the receipt of such rent; or (b) upon or with respect to the possession, leasing, operation, management, maintenance, alteration, repair, use or occupancy by Tenant of the Premises or any portion thereof; or (c) upon the measured value of Tenant's personal property or trade fixtures located in the Premises or in any storeroom or any other place in the Premises or the Property, or the areas used in connection with the operation of the Property, it being the intention of Landlord and Tenant that, to the extent possible, Tenant shall cause taxes on such personal property and trade fixtures to be billed directly to Tenant, and whether or not so billed, Tenant shall pay all taxes attributable to its personal property and trade fixtures; or (d) resulting from Landlord Work, Tenant Work or Tenant Alterations to the Premises, whether title thereto is in Landlord or Tenant; or (e) upon this transaction. Taxes paid by Tenant pursuant to this Section 4.04 shall not be included in any computation of Taxes payable pursuant to Sections 4.01 and 4.02.